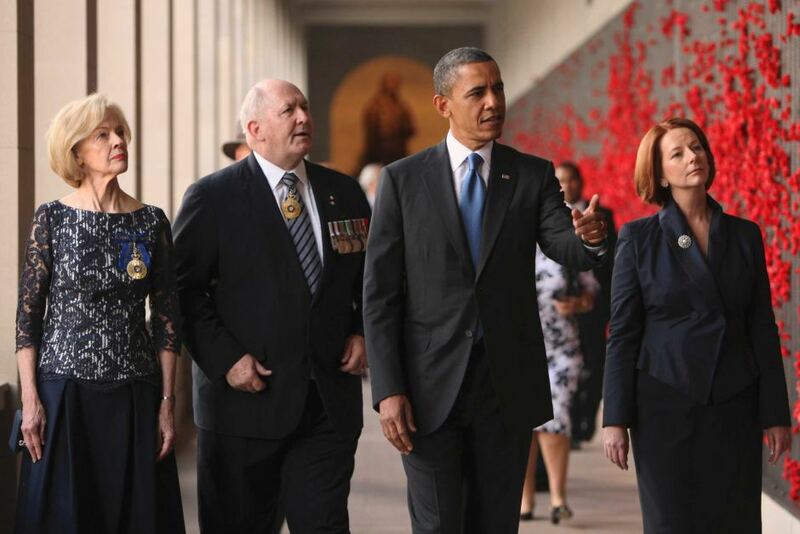 President Obama visits the Australian War Memorial. When relationships with an international power are important, often it is through an exchange of ‘stories’ that connection and mutual understanding is explored. Foreign dignitaries visiting Australia or New Zealand, are invariably taken by their hosts to one or more leading museum. Museums play a significant role in this type of public diplomacy as they provide a site of great symbolism where a nation’s history, environment and culture can be shared and ‘national stories’ exchanged. Museums often build up special relationships with other countries over many years as has been the case, for example, with the Australian National Maritime Museum and the USA; Questacon – the National Science and Technology Centre and Japan; and the Western Australian Museum and the Dutch Government, amongst many others. The close ties developed with ambassadors, consuls and embassies, here and overseas, helps build a scaffold of trust and understanding, at many levels, with other countries and regions. Regardless of whether they are national, state or regionally funded institutions, the development of international relationships is integral to the work of major museums. In 2013-14 alone, CAMD museums signed formal agreements with over 25 countries to develop and tour exhibitions, exchange loans, undertake scientific research collaborations, and promote professional development with staff and skill exchanges. Most prominently in the public eye are the exhibitions and other shows brought to Australia and New Zealand or developed here and toured overseas. In 2014 , for example, Aztecs was developed and toured by the Museum of New Zealand Te Papa Tongarewa in partnership with the Mexican National Council for Culture and the Arts and the National Institute of Anthropology and History – Mexico, the Australian Museum and Museum Victoria. This year (2015) the Imperial War Museum (London) and Museum Victoria are cooperating to bring The WWI Centenary Exhibition: The War That Changed The World to Melbourne for its world premiere. The National Museum of Australia signed a new four-year partnerships with the British Museum – which will see the Encounters exhibition, including items loaned from both collections, visit Canberra in late 2015. The NMA has also recently signed Memorandums of Understanding with the National Museum of China and the National Art Museum of China. Museums have also collaborated closely here and with overseas museums to stop the illicit trafficking of cultural materials from country to country. Many other museum international collaborations are far less visible but no less important. The Western Australian Museum (WAM), for example, has much sought after expertise in maritime archaeology which it shares with international partners from the UK, the Netherlands and the USA on the Shipwrecks of the Roaring Forties project. In 2014 WAM won an International Council of Museums – Australia award for its work with a South Korean Maritime Archaeology team and in the same year it signed an MoU with the Indonesian Government to share skills and build capacity to safeguard underwater cultural heritage in the region. Other examples of international collaborations include the 2012 multi-stage expedition undertaken by the Australian Museum to study land and marine fauna in Timor-Leste; forming the basis for conservation planning and a Protected Area Network in one of the world’s youngest nations. In 2014 the Australian Museum also led a Southern French Polynesia expedition to survey biota in the shallow waters of the Austral and Gambier Island groups. Museums have also been closely involved in the development of international collaborative organisations, mostly recently SciColl which aims to ensure the accessibility and management of scientific collections held in museums and other research facilities around the world. Pacific relationships have been an important focus of many museum research relationships. Since 2005 a number of Australia and New Zealand museums have developed close relationships with museums in PNG and Pacific Island communities including Fiji, Samoa, Vanuatu and the Solomon Islands as part of the ICOM – Australia Museum Partnership Programme. This work includes improving and sharing skills in research, museum management and conservation. Further afield museums and centres like Questacon have provided exchanges of staff and skills with science educators from countries such as Japan, the USA, Vietnam, Indonesia, Thailand, Singapore and China as well as wider regions in the Middle East and Africa. Museum directors, scientists, curators and educators have the knowledge, contacts and professional skills to foster the cross-cultural understanding necessary for the development of long-term, productive relationships between Australia and its international partners. The relationships thus forged can help to create a positive context within which more formal economic and trade relationships can flourish. They often prove to be relationships which can endure even when formal Government to Government links have foundered.